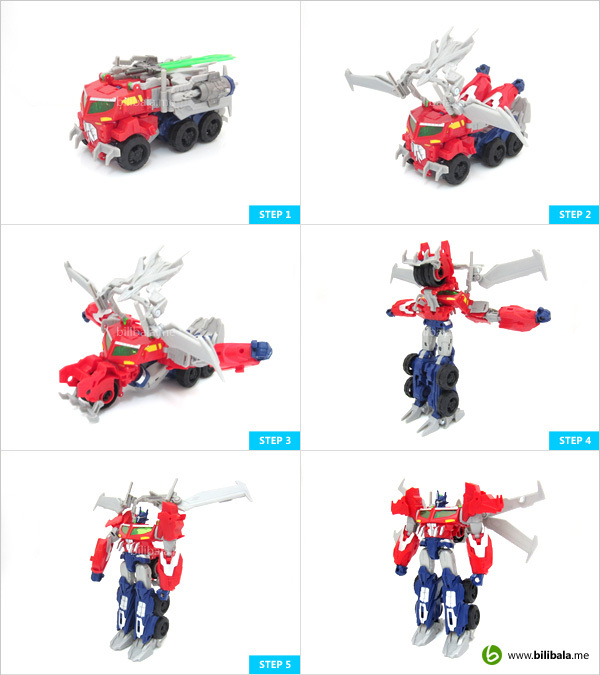 Optimus Prime is definitely the only Autobot to have dozens and dozens of new molds. 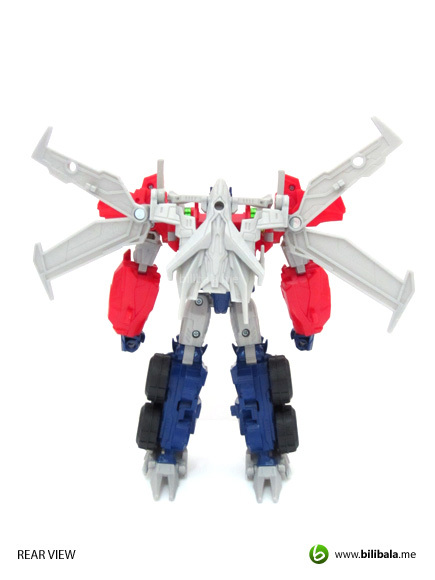 Well, considering him as the longest running Autobot leader, you will not be bored by how they are infusing him with new features for every reincarnations. 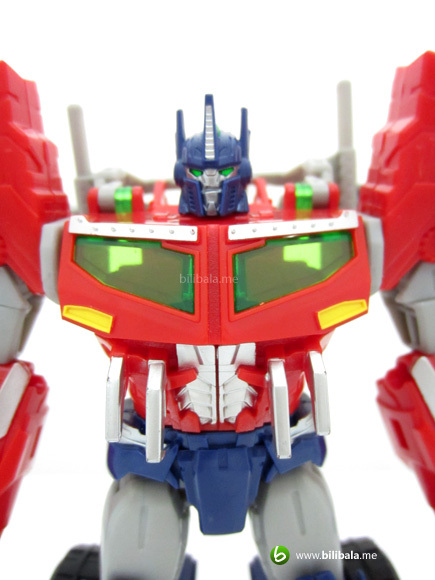 Every single of his reincarnation sure does have some unique points which strikes the balance of the familiarity of him being THE Optimus Prime and some new features which make him look different from his old self. 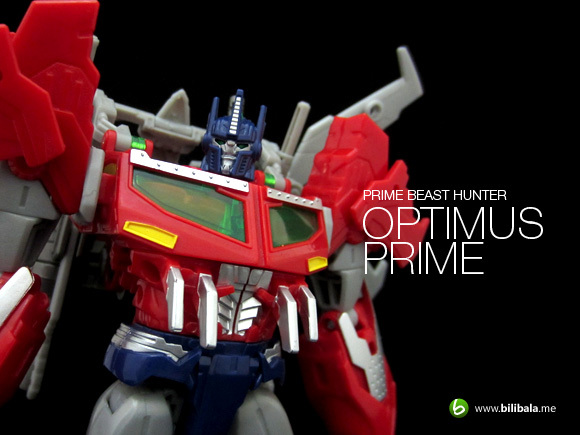 What we are having here today is the latest addition to the Optimus Prime family, the Transformer Prime Beast Hunter version. 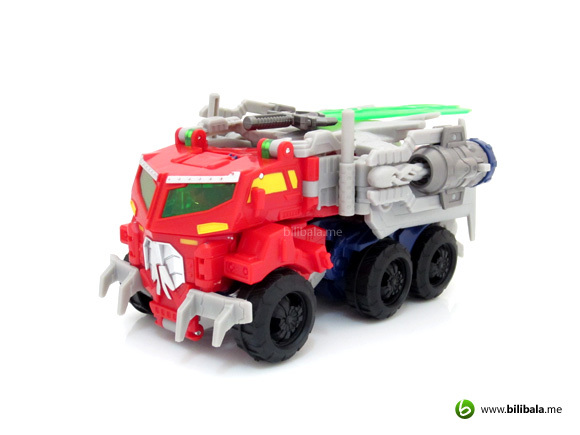 Read on to find out what is so fancy about this mean looking voyager is going to offer you. As a beast hunter, expect to see more spiky and edgy kinda look being incorporated in this line of design. 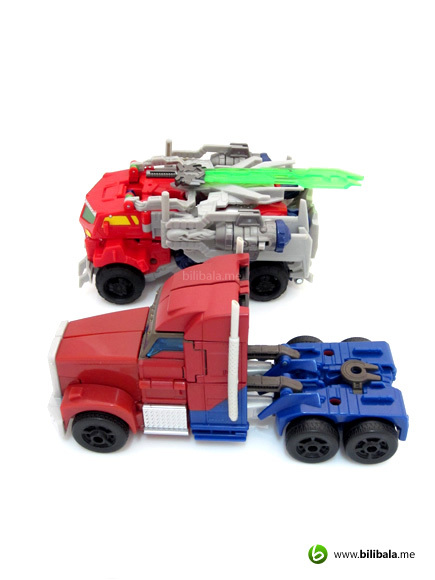 Even for the spanking new alt mode of Optimus Prime, you will see elements of “isometric-ly” designed panels here and there. 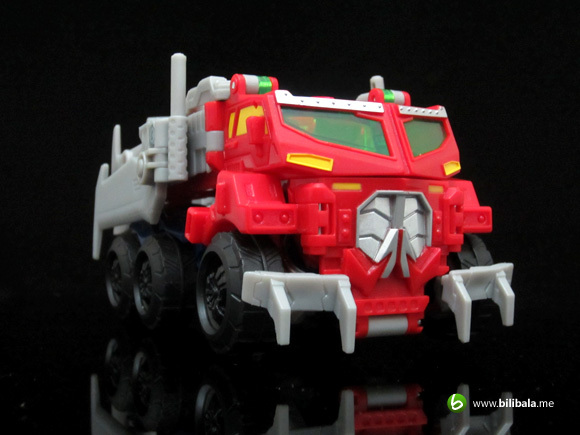 An obvious example of spike driven design is the mine-sweeping parts that replace the normal bumper. 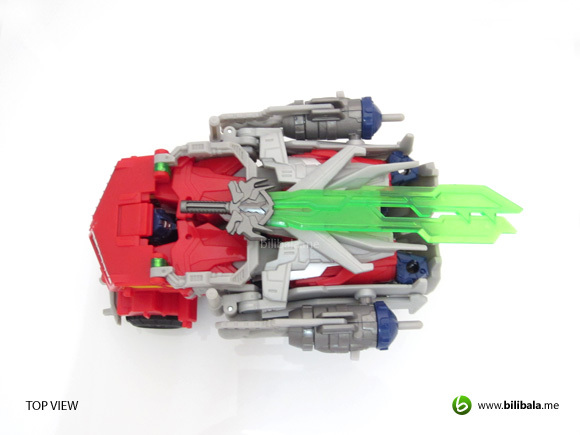 The overall alt mode design looks bulky but definitely not clumsy with detachable jet packs to add in the sporty feel. It doesn’t weight quite as much though. 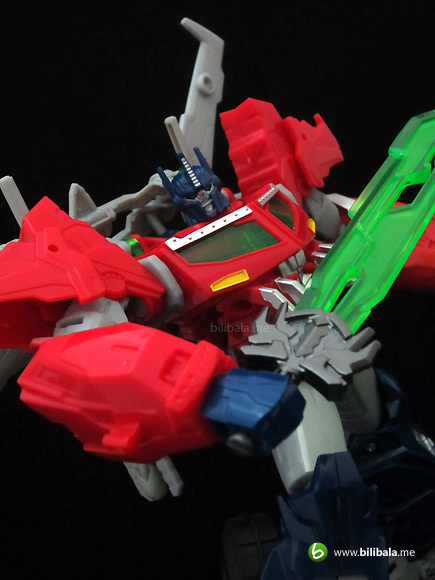 Beside the familiar light grey, red and dark blue scheme of the Optimus Prime, you will also see yellow and neon green color being introduced to spice out the ordinary. Most of the colors are not painted and remain as the raw plastic colors except the yellow and minor metallic silver. The neon green is newly introduced to highlight its polygonal windows and the light saber. Personally felt, the use of the opaque light grey color does make him a bit plain. 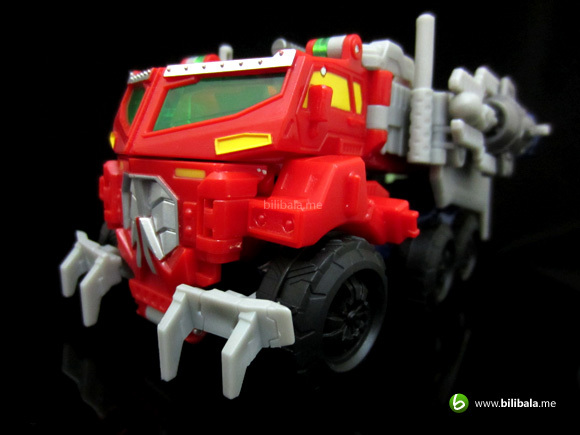 However, the overall new design poses much complexity of details if compared to the previous version in which the previous has a far more simplicity in outlining the structure of the truck. In additional, there is no special treatment to the tyres and rims (as normal). Just hard black plastics which work like a charm. 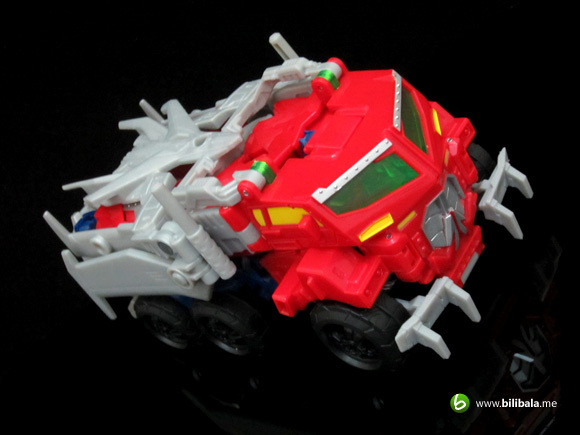 The rear of the alt mode isn’t as exciting and in fact, it is bluntly designed with just displaying 2 flipped legs. There is a completely removal of the trailer connection point here as we don’t really expect a trailer extension for him in the coming new episodes. 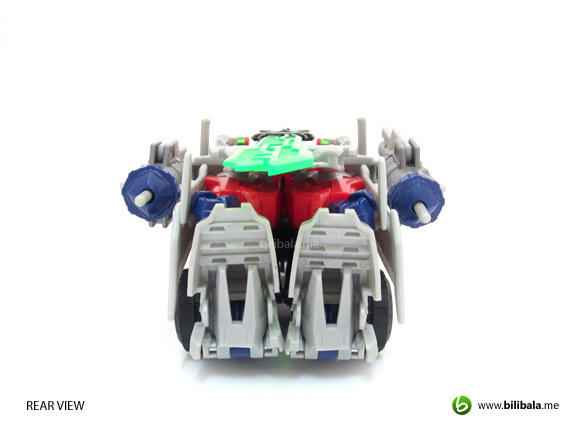 He looks like a jet powered truck from the top view. 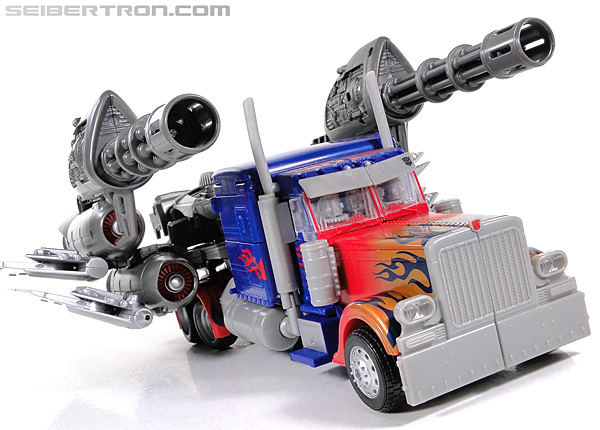 Another inspiration from the Jet wing Optimus Prime from Dark of the Moon series perhaps? 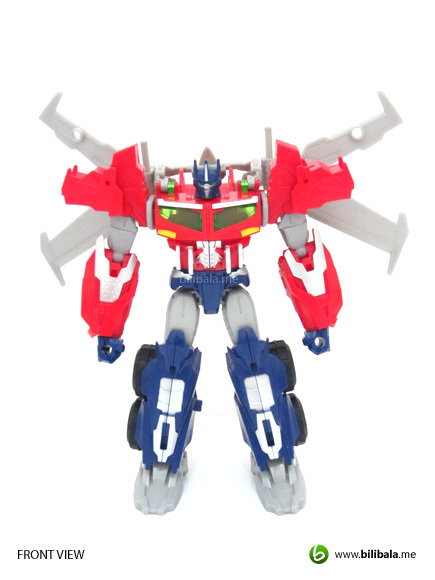 Well, if you are looking for an Optimus Prime that comes bundled with a jet pack, this is truly the piece for you. 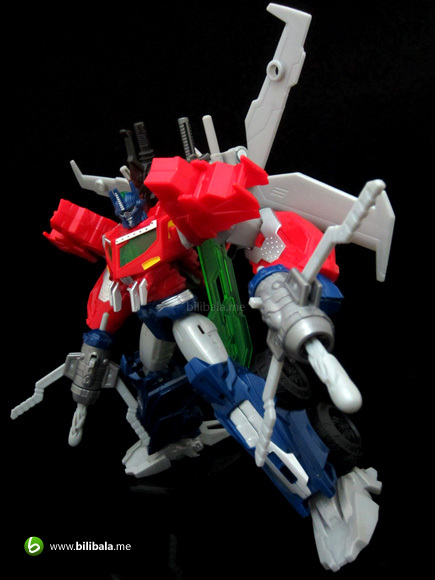 Just that he comes with a non-detachable jet pack. 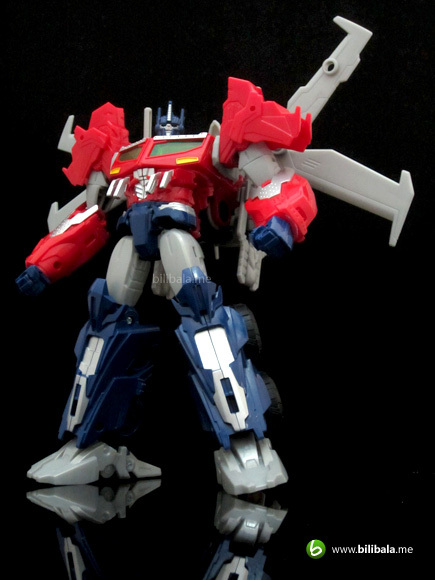 The overall Optimus Prime’s design follows closely as the new series with the same bulky body figure, broad shoulders. Personally i liked it much cause of his bulkiness. 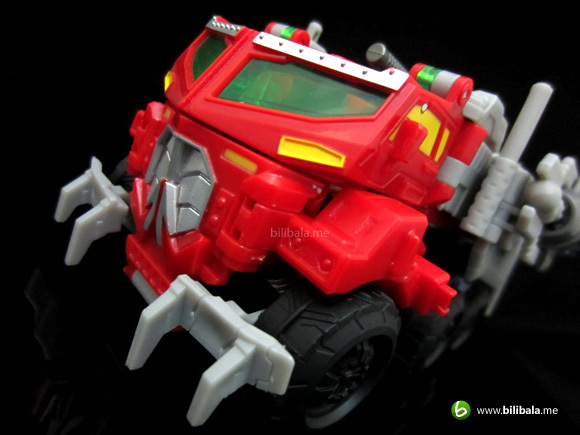 I just like bulky robots like Bulkhead. The only back kibble you get is the jet pack itself. 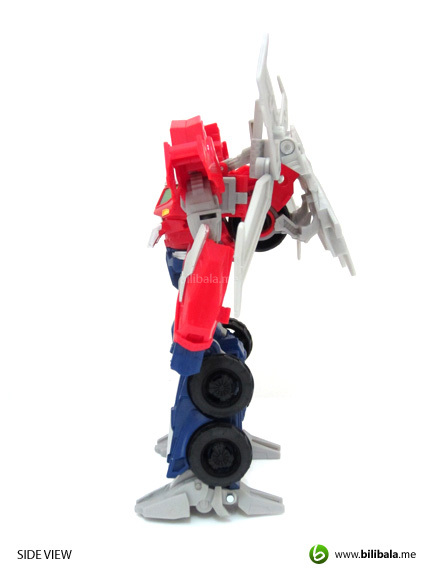 While it doesn’t contribute as much weight, my Optimus Prime does have loose hip joints which inadvertently falls back due to the jet pack pulling the whole body down. From the back of the wings. 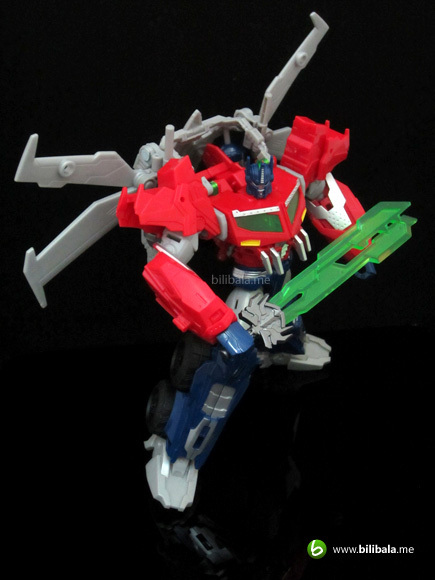 Looks very “organic” design and it sure looks like a dragon head being stuffed onto Optimus’ back for the reason. 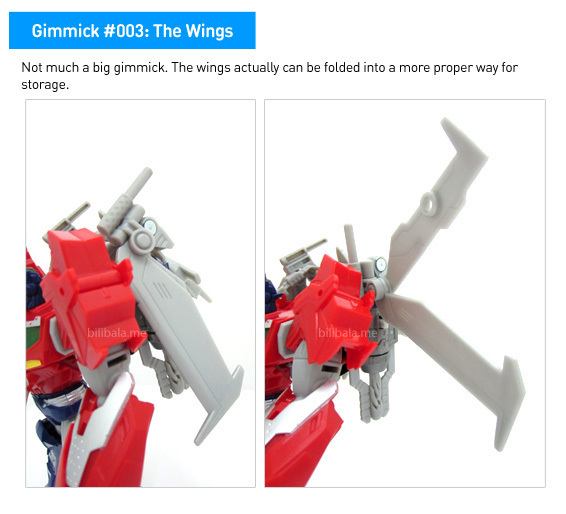 The pairs of wings though, do remind me of Thumbelina wings. What a crossover with modern and classic I must say. Speaking of the headpiece, it doesn’t a bit reflect of how the series is. 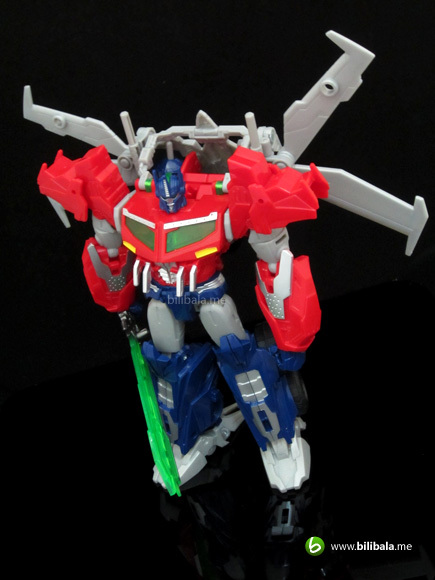 In fact, he looks nasty and menacing as what a Decepticon will look like. Especially with the light piped green eyes and a grinning face, he does look like a possessed gorila on the loose. 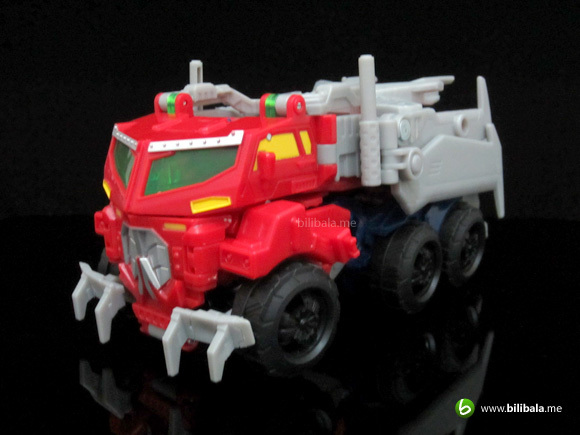 The similar spikes you seen in the alt mode have been imitated in still metallic painted ones in the robot mode. 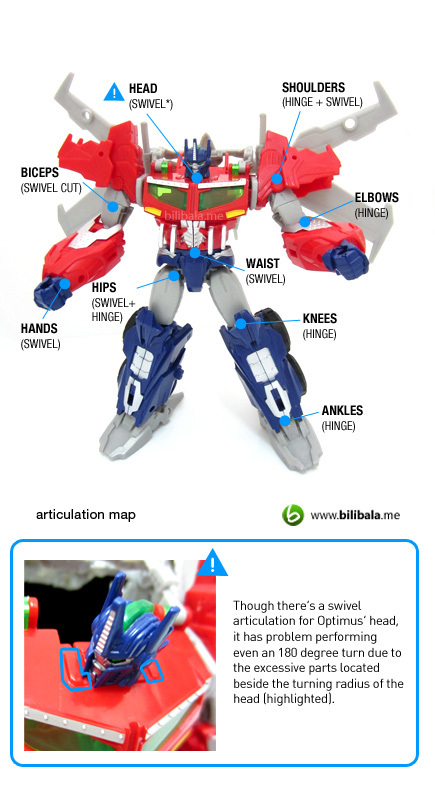 Strangely like all RID figures, there are no insignia to be seen in both alt and robot mode. Transformation is considered as intermediate. Isn’t as complicated as a voyager should be but still involving. 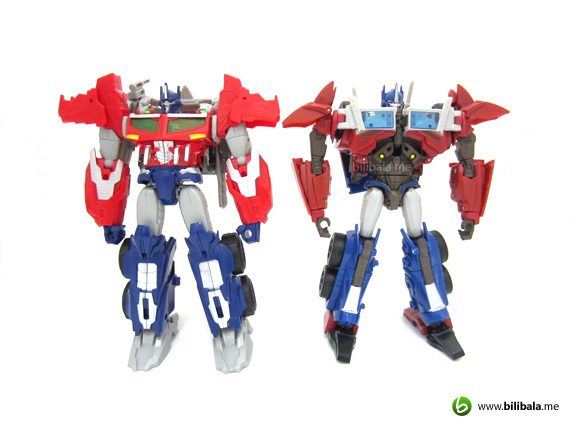 A quick comparison with his other form: The First Edition Optimus Prime from season 1 & 2 Prime series. 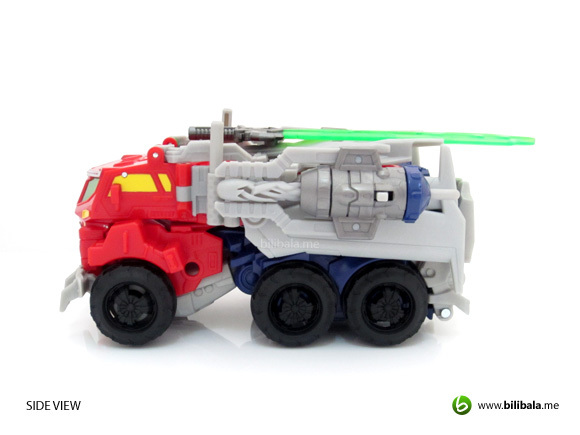 Both of their sizes are quite near but of course, both are 2 entirely different designs in alt and robot mode. 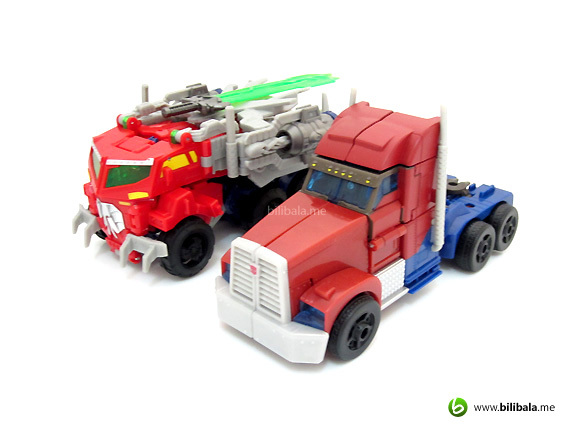 The old First Edition version still actually look bigger from the side with a more lengthy body that includes the trailer connector. 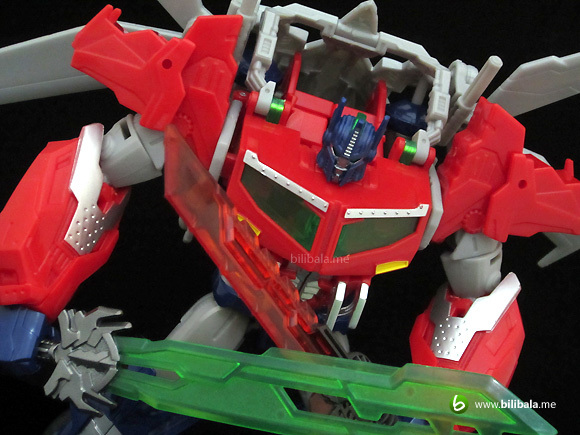 Overall complexity of details still the Beast Hunters version is on the winning track. 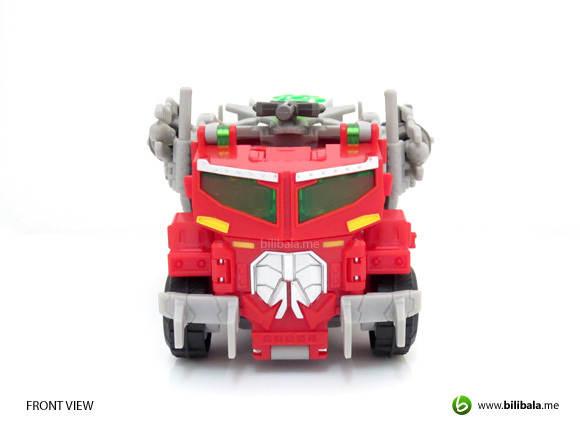 Comparison in robot mode. 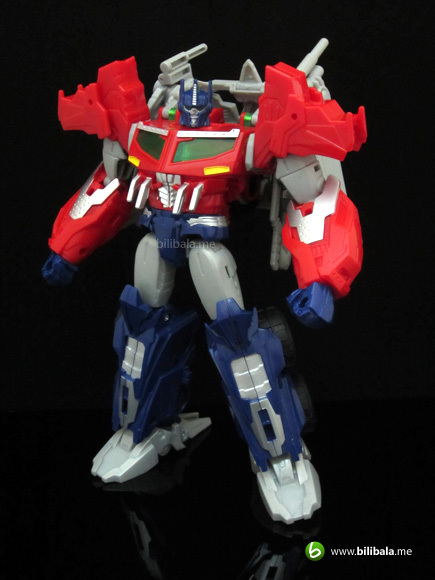 Shoulder pads seem alike but overally, the new Optimus Prime exhibits much bulkier compared to the old self. 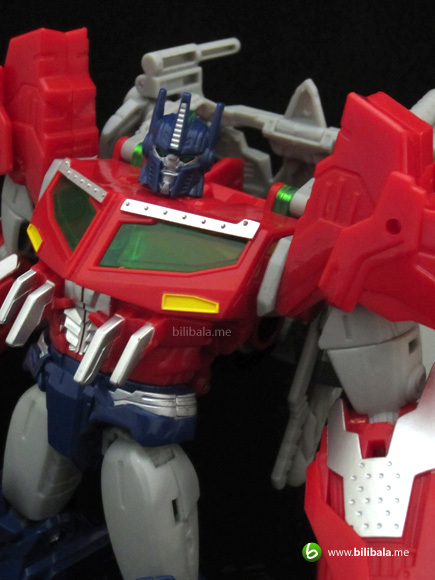 If you like bulky, jet-winged Optimus Prime with a nasty looking head sculpt, this is definitely the piece you wouldn’t like to miss. 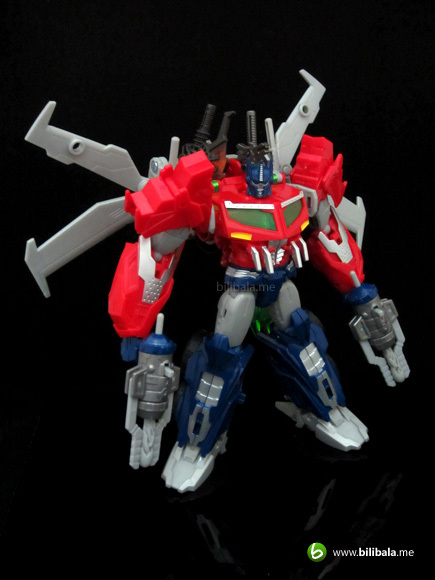 At least I prefer this over the first version with the newer one having more gimmicks and play-ability. 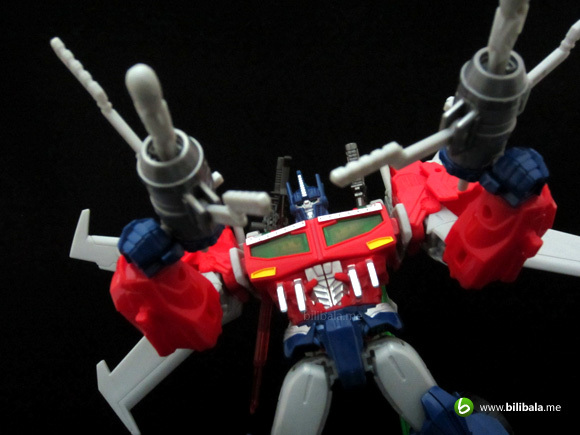 What I dislike?– Nasty looking headpiece; quite a bit of light grey plastic which blunts the looks; can’t do a proper turn of his head; loose hip joints mar the stability of the figure. I saw this from few weeks back. But i gotta say the plain and bare plastics kinda turn me off. 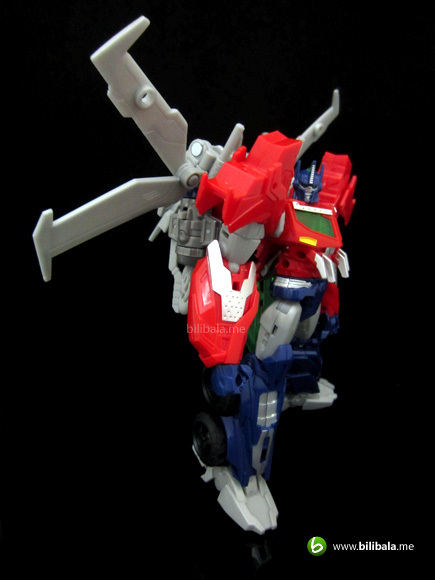 Will wait the Takara version and see.